The average recovery rate increased from 63 percent in 2009 to 67 percent in 2010, with approximately 15 percent of all resolutions resulting in full first-mortgage recoveries, bolstering lenders’ confidence in the market and generating a rise in REO sales activity. By delaying their liquidation of distressed assets until after the worst of the downturn, lenders have been able to avoid the fire sale many investors and opportunity funds anticipated. 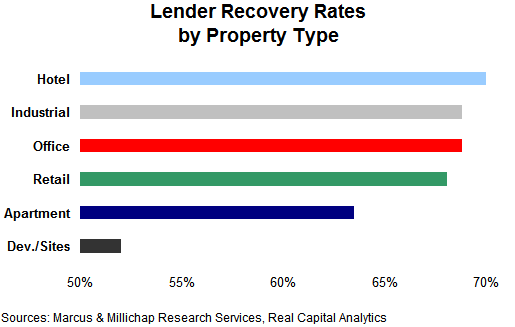 Lender recovery rates will continue to edge up through the remainder of 2010 and early 2011 as vacancy rates stabilize and transaction velocity accelerates, allowing lenders to bring additional properties to market. Deals involving CMBS loans typically result in some of the lowest recovery rates, as securitized lending increased dramatically between 2005 and 2007, a period characterized by peak property prices, lax underwriting standards and high-leverage loans. Recovery rates also have been influenced by traditional demand drivers, such as location and quality. 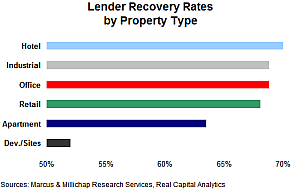 Properties in coastal markets have achieved higher recovery rates, with lenders faring best in Seattle, San Diego, Los Angeles, Miami and Manhattan. Markets with significant amounts of undeveloped land in the Southeast and Southwest, as well as Midwestern metro areas, fall at the low end of the spectrum. Apartments have already begun to post improvements in occupancy and rents but remain at the low end of the recovery rate spectrum, with lenders recapturing an average of 64 percent on resolutions. This reflects high concentrations of distress involving properties last traded at the height of the housing boom, when condo conversion deals significantly inflated apartment prices in many markets. Warehouse properties, on the other hand, experienced less price appreciation than apartments through the boom period and now boast one of the highest recovery rates among the core property sectors at 70 percent. This entry was written by marcusmillichap, posted on October 1, 2010 at 9:05 pm, filed under Research and tagged Commercial Real Estate Distress. Bookmark the permalink. Follow any comments here with the RSS feed for this post. Trackbacks are closed, but you can post a comment. I give it 5 years before we see a significant recovery. As an REO mgr, we see liitle if any signs of life even in Seattle. Patience and loan loss reserves are the keywords of the day. It’s no secret, Arizona is stuck in this mess just as it was in the RTC days. And, with similar market dynamics, we will once again rise out of this. Wonderful goods from you, man. I have understand your stuff previous to and you’re just extremely magnificent. I actually like what you’ve acquired here, certainly like what you are saying and the way in which you say it. Fantastic website. A lot of helpful information here. I’m sending it to several pals ans also sharing in delicious. And obviously, thank you for your sweat! it, you will be a great author.I will be sure to bookmark your blog and will eventually come back in the foreseeable future.